The global success of Russia's Nightwatch and Daywatch films may be leading to a renaissance of fantasy/science-fiction movie projects in that country. Now being filmed in Russia, Arkady and Boris Strugatsky's The Inhabited Island, a.k.a. Prisoners of Power, scheduled for release in January 2009. 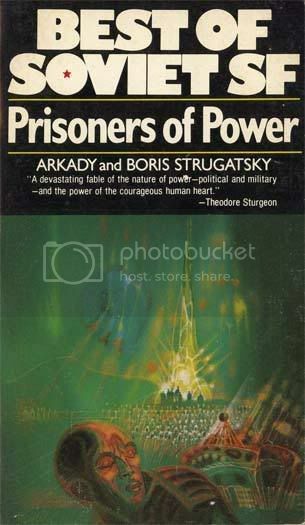 Prisoners of Power also known as Inhabited Island (Russian: Обитаемый остров, IPA:[obɪ'taʲemɨj 'ostrof]) is a science fiction novel written by Soviet authors Arkady and Boris Strugatsky. It was written in 1969 and originally published in 1971, the English translation was released in 1977. The protagonist is a young adventurer from Earth — Maxim Kammerer who gets stranded on an unknown planet Saraksh. The story describes the adventures of Maxim Kammerer. Kammerer is an amateur space explorer from Earth. This occupation is not considered serious and Kamerer is regarded as a failure by his friends and relatives. The novel starts when Kammerer accidentally discovers an unexplored planet Saraksh inhabited by a humanoid race. The level of technological development on the planet is similar to mid-20-eith century Earth. Recently, the planet had a nuclear and conventional war and the predicament of the population is dire. When Kammerer lands, the natives mistake his spaceship for a weapon and destroy it. At first, Kammerer does not take his situation seriously. He imagines himself a Robinson Crusoe stranded on an island inhabited by primitive but friendly natives. He is looking forward to establishing contact and befriending the population of the planet. However, the reality turns out to be far from glamorous. Kammerer finds himself in the capital of a totalitarian state, perpetually at war with its neighbors. The population is governed by the oligarchy of Unknown Fathers through brutal police and military repression. The city is grim and polluted. Ordinary populace leads the life of privation and misery. What goes on around Kammerer does not make sense to him, since his own society is free from war, crime and material shortages. Eventually, it is revealed that to maintain the loyalty of the population, the Fathers employ mind control broadcasts. The broadcast towers pepper the landscape of the country. The mind-altering capabilities of the towers are kept secret, they are disguised as ballistic missile defense installations. Constant broadcasts suppress the ability to evaluate information critically, hence making the omnipresent regime propaganda much more effective. In addition, twice a day, intense broadcasts relieve mental stress caused by the disconnect between the propaganda and the observed reality by inducing an outburst of blinding enthusiasm. Is it just me or is does it seem like the number of Russian (or, for that matter, any of the countries from the former Soviet bloc) films that make their way to North American shores is pretty sparse? I can think of Solaris but not much else comes to mind. There was that vampire movie a few years ago as well (whose name I can not remember) but there must be more. Is it the quality of the films? Lack of distribution deals? Something lost in translation? Hey, is this the russian equivalent of Cold War scifi? We only ever see and hear the influence of Cold War in western writing. I suppose we assume the reverse situation is banned where publication is concerned in the old Soviet Union? I believe you're thinking of Night Watch, which was directed by Timur Bekmambetov, who also directed one of my favorite movies of the summer, Wanted. I'd say that, in general, America doesn't get a lot of foreign films released on our shores. How many South Korean action films, or Mexican horror movies, or Turkish science-fiction rip-offs, actually make it to the US cineplex? We'll get the serious Oscar-caliber art films, and the occasional Japanese horror film (although even there, it's the Hollywood version we see first), but we seldom get anything from the rest of the world. Maybe that's because America is the leading film producer of the world, and our "Hollywood" brand is so extremely successful, there's no room for anyone else. Kind of like soft drinks -- we've got Coke and Pepsi on our shores, so how often do we get served an ice-cold Ethopian Mirinda? Night Watch is indeed what I was thinking of. But we do some foreign films in the US market; not necessarily in every genre category but we do some that hit the big screens (eg: Just recently it was Dragon Wars from South Korea). I can of several French films, some Asian films, even some recent Mexican films that, while they may not have had major studio releases, have at least been shown on independent labels. It just seems to be a lack of Russian films making the jump.